Are you experiencing an odd type of pain in your body? It could be a pinched nerve. Read on to learn what it is and how to fix it. Pain is something that can really ruin your life. Just ask the more than 11% of Americans who suffer from chronic pain at some point. The best way to find relief is to figure out the cause. Your brain and spinal cord are attached to several nerves that send messages to your body. When there is pressure or force on some area of a nerve, the nerve is pinched. Your brain gets warning signals of a pinched nerve that include weakness, pain, and numbness. Pinched nerves can happen anywhere in the body. The most common areas for a pinched nerve include elbows, neck, wrists, and back. Symptoms could change or get worse when you are lying down or just getting up. Pinched nerves can lead to other problems like tennis elbow, carpal tunnel syndrome, and sciatica. There are different causes for a pinched nerve. If you have bone spurs or herniated discs, they could compress your nerve. Arthritis can also cause pinched nerves. Bad habits and certain repetitive activities can also cause pinched nerves. Injuries and obesity can also lead to pinched nerves. If you stand, sit, or walk with poor posture, you could compress your nerve and get your spine out of alignment. If your spine is not in proper alignment, you may need a spinal adjustment. There are some ways you can relieve a pinched nerve at home. Rest always gives your body time to heal. Stay away from activities that could irritate your nerve even more. Try using proper ergonomic positions and an ergonomic keyboard and mouse at work. Standing workstations are all the rage for a reason, and can help prevent bad posture. Heat relaxes muscles which could be tight around your nerve. Heat will also increase blood flow to help your body heal. Apply heat directly to your pinched nerve area for about 10-15 minutes. Ice reduces inflammation and swelling. Wrap your ice pack with a towel and hold it on your nerve for about 10-15 minutes at a time. You could relieve some tension by stretching the area around your nerve. You could also try yoga to help relieve some tension. If you feel any pain while exercising, stop immediately before you cause more damage. You could try putting a splint on the affected area at night to prevent further damage. The splint helps take some pressure off the nerve. If you don’t exercise, you should try adding some exercise like swimming, biking, or walking. Lose extra weight to help reduce any pressure on your nerves. You should also stretch before and after exercising. 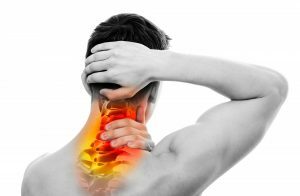 If you are still having issues with a pinched nerve, Premier Chiropractic Clinic can evaluate your condition and help you determine the best plan to reduce pain. Proper adjustments can help you feel better and keep the pain away. Make an appointment today with us to get the relief you’ve always wanted.